John Hersey's unembellished account of the atomic bombing of Hiroshima, Japan by American forces during the closing days of the Second World War (1939-1945) was first published in The New Yorker magazine in August 1946, one year after Japan's unconditional surrender to the Allies. Hersey based his story on interviews he conducted with six survivors of the blast in days and weeks after the detonation. It caused a national sensation when first published and is today widely noted as one of the finest pieces of journalism of the 20th century. It was later reissued in book form. 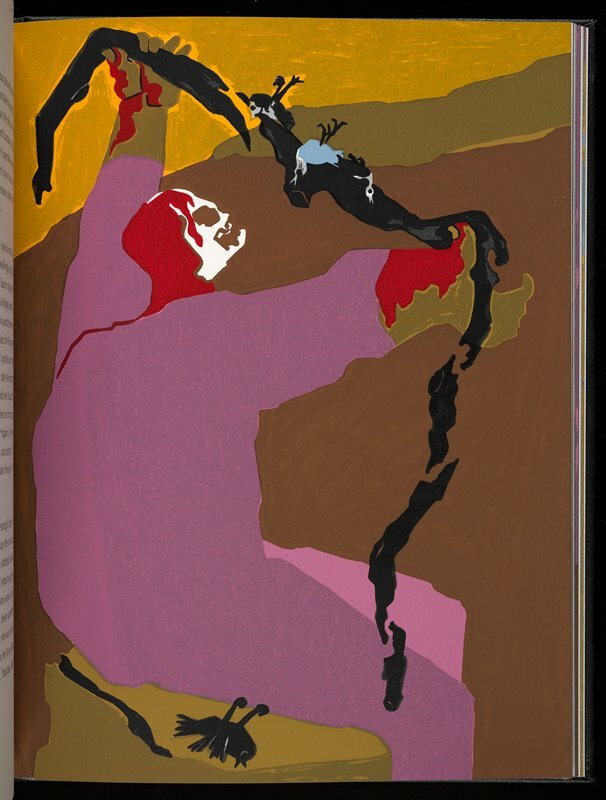 In a series of boldly articulated full-page screenprints, Jacob Lawrence sympathetically captures the intense emotions and vivid impressions of Hersey's account. Lawrence envisions the victim's reaction to the moment of the "noiseless flash" of the blast on August 6, 1945, their imminent death presaged by the skeleton-like appearance of their bodies. Bruce B. Dayton, Wayzata, Minn.; given to MIA, 1987.